In this review the healthcare experts at Legionella Control International take a detailed look at the Department of Health’s HTM 04-01 and how it can guide those responsible for the delivery and management of water supplies and provision of safe water in hospitals and healthcare premises. While all premises should operate safe water supplies to protect those using and living in them from harm; hospitals, care homes and other healthcare settings are of special concern. If the water supplies in these facilities become contaminated with Legionella bacteria, for example, those using or staying at the facilities may be exposed to increased risk especially if they fall in to one of the higher-risk groups of the population. People who are elderly, frail, suffer underlying health conditions or have compromised immune systems will be at greater risk of illness and infection. Who is HTM 04-01 suitable for? Anyone who is responsible for monitoring and managing a safe water system (be it hot, cold, or other) in a healthcare setting will benefit from reading through the documentation in HTM 04-01 and its various parts. The government website points out that the guidance should be used in association with the Approved Code of Practice ACOP L8, issued by the Health and Safety Executive (HSE). HSG274 Part 2 is also applicable when managing hot and cold water systems in hospitals, care homes and similar healthcare settings. Part A of the HTM documentation provides a useful glossary of terms and abbreviations used throughout. Two are of notable interest – the Water Safety Group (WSG) and the Water Safety Plan (WSP). The Water Safety Group or WSG is a group of specialists responsible for commissioning healthcare water systems if new ones are to be created. They also have responsibility for developing and managing the safety of existing water systems throughout the premises under their control. The WSG is typically formed from people from different, but associated disciplines, all of whom come together to contribute knowledge and information to help safely manage the water systems. The Water Safety Plan or WSP stems from the water safety risk assessment of the systems and is developed by the Water Safety Group. The WSG will adhere to the Water Safety Plan and ensure all possible hazards and risks are dealt with, accounted for, and controlled effectively to protect the health and safety of staff, patients, visitors and others. What is covered in Part A of HTM 04-01? Where will the water supply be drawn from? Which materials will/should be used during construction? Choosing appropriate water treatment and control programmes for waterborne pathogens including legionella and pseudomonas. There are separate sections on both hot and cold water supplies as well. The installation, testing, and commissioning of the new supply is another important element covered. By following the elements identified in HTM 04-01 Part A, there should be a natural reduction in the risks from legionella, pseudomonas and other waterborne pathogens. What is covered in Part B? Part B of the HTM covers issues associated with operational management of any water systems. This includes specific information about legionella and other waterborne pathogens that can present a risk to human health, especially those in hospitals and other healthcare settings. Where does Legionella bacteria come from? Which circumstances allow for greater colonisation and growth of legionella? Which conditions are derived from exposure to legionella bacteria? How can one control legionella in hot/cold water systems? How can people inhale the bacteria if it is present in the water supply? Part B highlights the fact that legionella is very likely to be present in any water system, whether natural or man-made. Therefore, the aim in a healthcare environment is to prevent the bacteria from multiplying to reach numbers that would pose a significant health hazard. It also points out how important it is to test any water treatment plans put in place to manage the risks from legionella etc. While a water treatment plan may seem ideal, only regular testing and confirmation of this will ensure the system is as safe as it is believed to be. Adjustments may be required if the agreed water treatments are not having the desired effect. Another key point highlights the use of biocides in a healthcare setting. Water treatment biocides can usually be used safely to control and limit legionella bacteria in a water supply through a process called secondary disinfection. However, care must be taken as some patients may be at greater risk of being affected by these biocides. The Water Safety Group should always assess and highlight any potential risks of this nature and act accordingly. This is a good example of how the risk of legionella bacteria becomes very different when it can develop within a healthcare setting. The very people who are most at risk of falling ill will likely be present in this setting, making it vital that proper water management plans are in place and followed consistently. While the Water Safety Plan should be clearly thought out and adhere to the guidance given in HTM 04-01, it should also be viewed as a document capable of changing as and when required. If the water systems change, the WSP must be assessed for its ongoing suitability to maintain safe water supplies. Testing for legionella is highlighted in section 10. A useful table shows which actions should be taken depending on the presence of bacteria and how much of it is detected in the water. Additionally, water safety risk assessments should highlight when and where testing should occur. Appendix B further gives information and advice on which actions to take if an outbreak of legionellosis including Legionnaires’ disease should occur within a hospital or healthcare facility. As a notifiable disease, there should be detailed incident plans in place that must be used should an outbreak of Legionnaires’ disease occur. What is covered in Part C of HTM 04-01? Part C covers the control of Pseudomonas aeruginosa in connection with augmented care patients. It does not cover legionella, which has already been highlighted in the previous section. 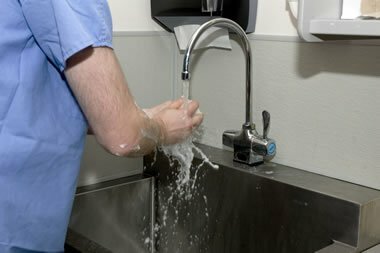 It looks at the control of Pseudomonas aeruginosa in hot and cold water systems, protecting augmented care patients, and gives examples of a typical risk assessment and sampling sheets. What is covered in the TMV supplement D 08 added to HTM 04-01? The D 08 supplement is a performance specification included as part of the Health Technical Memorandum for 04-01. It covers the use of thermostatic mixing valves (TMVs) in healthcare premises. There are sections on sampling, leak tightness, durability, and performance. These are important to consider within a hospital care home or similar healthcare setting, where some of those present may be at greater risk of being scalded if they are exposed to hot water. It is vital to make sure these TMV valves work correctly and are set at the correct temperature. It is possible for the hot water temperature to be set low enough to allow for easier development of legionella bacteria. As such, it is an important point to note when risk-assessing a water system in a healthcare setting. The documents that form the HTM 04-01 contain in-depth information about many aspects of hot and cold water systems present in hospitals and healthcare settings. While it is always important to assess any water system for the risk of legionella and other waterborne pathogens, these documents have been produced to focus on the specific risks present here. Legionnaires’ disease is preventable if the water systems it can potentially develop in are properly designed, built, maintained, and treated. These reports are designed to make that process easier and more straightforward for those responsible for making sure this happens. A good Water Safety Plan backed by a competent Water Safety Group should help to protect those who need it most. Our teams of healthcare water safety specialists support those responsible for the control of waterborne pathogens including Legionella bacteria in the workplace, helping them to protect their people and meet their health and safety obligations in this specialist area. We deliver professional water safety risk assessments for legionella, pseudomonas and other waterborne pathogens, water testing, independent compliance auditing, City & Guilds training and other environmental risk management services that help keep staff and others safe.